Focal nodular hyperplasia (FNH) is the second most common tumor of the liver, surpassed in prevalence only by hepatic hemangioma. FNH is believed to occur as a result of a localized hepatocyte response to an underlying congenital arteriovenous malformation. FNH is a hyperplastic process in which all the normal constituents of the liver are present but in an abnormally organized pattern. Results of liver function tests in these patients usually are within the reference range. See the image below. 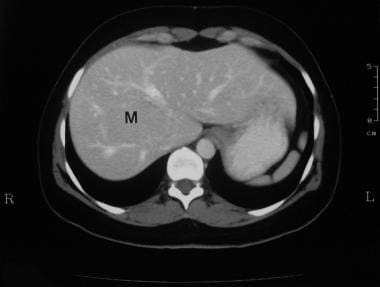 Dynamic MRIs in a 36-year-old woman referred for a gallbladder sonography, during which the patient was found to have a vague ill-defined hypoechoic mass in the right lobe of the liver (not shown). 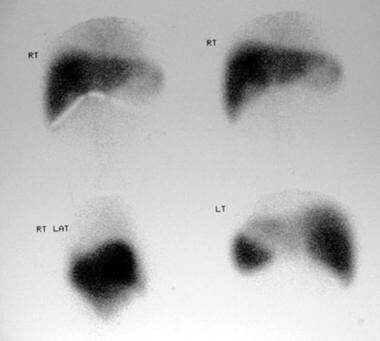 (Top left) Gadolinium-enhanced T1-weighted MRI demonstrates an ill-defined low-signal-intensity mass. (Top right) The mass enhances intensely in the arterial phase after the administration of contrast medium. (Bottom left) Minor enhancement persists in the portal venous phase. 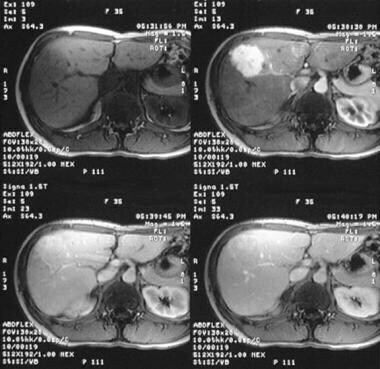 (Bottom right) The lesion becomes isointense relative to the liver on delayed images. Although the use of contraceptive agents has not been implicated in the pathogenesis of FNH, their use is associated with an increase in the risk of complications for patients with FNH, and they may be a factor in the development of FNH. In symptomatic females, hemorrhagic foci or infarctions may occur within the FNH; these are aggravated by administration of contraceptive agents. 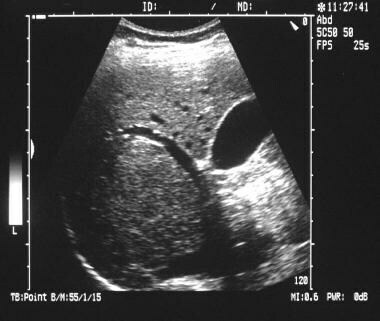 The rare complication of a spontaneous rupture into the peritoneum has also been associated with contraceptive use. In most patients, the clinical course is silent, and FNH is incidentally discovered during cross-sectional imaging, angiography, radionuclide liver scanning, or surgery. In most cases, FNH occurs as a solitary lesion (80-95%), but multiple lesions may occur. Although FNH usually has no clinical significance, recognition of the radiologic characteristics of FNH is important to avoid unnecessary surgery, biopsy, and follow-up imaging. Malignant transformation of FNH has not been reported. FNH must be differentiated from a fibrolamellar variant of hepatocellular carcinoma, with which it shares imaging and gross features. The diagnosis of focal nodular hyperplasia (FNH) is made on the basis of the demonstration of a central scar; however, a typical central scar is not demonstrated in every patient. In as many as 20% of patients, a scar may not be visible. Moreover, a central scar may be found in some patients with fibrolamellar hepatocellular carcinoma, hepatic adenoma, or intrahepatic cholangiocarcinoma. This limitation applies to all cross-sectional imaging techniques, including US, CT, and MRI. The detection of lesions by use of radionuclide scans with technetium-99m sulfur colloid depends on the concentration of Kupffer cells in the FNH. If the concentration of Kupffer cells is low, FNH may appear as a photon-deficient mass that is indistinguishable from other liver mass lesions. On angiograms, the characteristic spokelike appearance is demonstrated in only 33% patients; moreover, FNH may be avascular in 10% of patients. Focal nodular hyperplasia is subdivided into 2 types: classic (80%) and nonclassic (20%). Nonclassic FNH is further divided into 3 subtypes: telangiectatic FNH, FNH with cytologic atypia, and mixed hyperplastic and adenomatous FNH. Telangiectatic FNH shares several morphologic patterns with hepatocellular adenomas. Paradis et al conducted a study in which they attempted to reclassify telangiectatic FNH on the basis of molecular analysis. Their results showed that the molecular pattern seen in cases of telangiectatic FNH closely resembles that of hepatocellular adenomas. They suggested that telangiectatic FNH be referred to as telangiectatic hepatocellular adenoma. nonenhanced CT scans, focal nodular hyperplasia (FNH) may appear as an isoattenuating or slightly hypoattenuating mass. Nonenhanced images are important because FNH may be missed without a precontrast study (see the images below). After the administration of contrast material, the lesion becomes hyperattenuating relative to the surrounding liver in the arterial phase; this occurs approximately 20-30 seconds after the bolus of contrast agent is administered. In the portal venous phase, 70-90 seconds after the bolus injection, FNH is less conspicuous and becomes isoattenuating with the rest of the liver. During the delayed phase, approximately 5-10 minutes after the bolus injection, FNH is isoattenuating with normal liver. In 15-33% of patients, conventional CT scans show the hypoattenuating stellate central scar with a central core and radiating fibrous septa. The central scar may become hyperattenuating on delayed images because of delayed contrast washout from the scar; however, the central scar does not go through a hypoattenuating phase on helical CT scans. The scar is demonstrated as a hyperattenuating region in the portal venous phase. The central artery traversing the central scar may show early enhancement in the arterial phase. When characteristic features are seen in the appropriate clinical setting, one may be fairly confident of the diagnosis. Unfortunately, CT features of other benign and malignant lesions can mimic those of focal nodular hyperplasia (FNH). Although triple-phase CT scanning accurately characterizes most FNH lesions, CT findings are not as definitive in some patients with FNH. Rarely, a false-positive diagnosis of FNH occurs in cases of fibrolamellar hepatocellular carcinoma, as well as in cases involving other well-differentiated variants of hepatocellular carcinoma. In 94-100% of cases of FNH, the FNH lesion is isointense to hypointense on T1-weighted images; in 6% of cases, the signal intensity on T1-weighted images is hyperintense. On T2-weighted images, the lesion is slightly hyperintense to isointense in 94-100% of cases. After the administration of a gadolinium-based contrast agent, the enhancement pattern parallels that of contrast-enhanced CT. Dense enhancement is seen in the arterial phase; the lesion becomes isointense during the portal venous phase and isointense on delayed images. Late and prolonged enhancement of the central stellate scar occasionally occurs. MRI findings are not pathognomonic for FNH, but the use of MRI reticuloendothelial agents, such as superparamagnetic iron oxide (SPIO) and ultrasmall superparamagnetic iron oxide (USPIO), increase the specificity. On SPIO-enhanced T2-weighted images, FNH shows decreased signal intensity because of iron uptake by Kupffer cells. This finding is not specific to FNH, because hepatocellular adenoma and hepatocellular carcinoma also may contain Kupffer cells. According to Attal et al, telangiectatic FNH differs from typical FNH on imaging: the atypical features that were often observed with telangiectatic FNH were the lack of a central scar, heterogeneity of lesions, hyperintensity on T1-weighted MRI, strong hyperintensity on T2-weighted MRI, and persistent contrast enhancement on delayed contrast-enhanced CT or T1-weighted MRI. The authors described the features of US, CT, and MRI in cases of telangiectatic FNH and compared the findings with histopathologic findings in 13 cases of FNH. Purysko et al studied the performance of gadoxetate disodium-enhanced MRI to evaluate its performance and potential advantages in the characterization of FNH and hepatocellular adenoma of hepatocyte phase imaging in identifying features that distinguish FNH from hepatocellular adenoma. The authors concluded that gadoxetate disodium-enhanced MRI has accuracy in distinguishing FNH and hepatocellular adenoma, and the hepatocyte phase improved their distinction. The authors found that FNH enhances significantly more than hepatocellular adenoma and suggested that an enhancement ratio, in the hepatocyte phase, can be potentially used to improve diagnostic accuracy. Gadolinium-based contrast agents have been linked to the development of nephrogenic systemic fibrosis (NSF) or nephrogenic fibrosing dermopathy (NFD). For more information, see the eMedicine topic Nephrogenic Fibrosing Dermopathy. The disease has occurred in patients with moderate to end-stage renal disease after being given a gadolinium-based contrast agent to enhance MRI or MRA scans. NSF/NFD is a debilitating and sometimes fatal disease. Characteristics include red or dark patches on the skin; burning, itching, swelling, hardening, and tightening of the skin; yellow spots on the whites of the eyes; joint stiffness with trouble moving or straightening the arms, hands, legs, or feet; pain deep in the hip bones or ribs; and muscle weakness. For more information, see the FDA Public Health Advisory or Medscape. A false-positive diagnosis of FNH may occur with fibrolamellar hepatocellular carcinoma and other well-differentiated forms of hepatocellular carcinoma. On SPIO-enhanced T2-weighted images, hepatocellular adenoma and hepatocellular carcinoma may show decreased signal intensity, because Kupffer cells may be present. Doppler sonograms demonstrate an enlarged afferent blood vessel with central arterial hypervascularity and centrifugal filling to the periphery in a spokelike manner. Large draining veins may be seen at the periphery of the mass. High-velocity Doppler signals with arterial pulsatility may be recorded from arteriovenous shunts. Echo-enhanced Doppler US has a high sensitivity for detection of the feeding artery and for depiction of the radial vascular architecture in FNH lesions, especially for lesions that are located in the liver's left lobe. Power Doppler US has increased sensitivity for FNH and may help distinguish FNH from hepatocellular carcinoma. The lesion of focal nodular hyperplasia may be difficult to detect, because it is often hypoechoic to normal liver tissue. The specificity of US is low, but the specificity may be increased with Doppler US and echo enhancement. As is the case with other cross-sectional imaging, however, a specific diagnosis is sometimes not possible because the FNH lesion is similar to lesions of other benign and malignant diseases. The lesion may be missed entirely if the signal is isoechoic. US findings of FNH overlap those of hepatic adenomas and hepatocellular carcinomas, although the sensitivity and specificity improve with the use of Doppler US, particularly power Doppler and echo-enhanced Doppler US. The best imaging modalities for characterizing FNH are those modalities that can delineate the lesion's central scar or that can show Kupffer cell activity. The best modalities for identifying the central scar are CT and MRI; Kupffer cell activity is best demonstrated by radionuclide scans. In the future, however, MRI superparamagnetic contrast agents may challenge radionuclide scanning. Technetium-99m sulfur colloid scans in a 38-year-old woman referred for gallbladder scanning (same patient as in the previous 4 images). Images show complete filling of the mass depicted on sonograms and CT scans. Tc-99m sulfur colloid uptake in patients with FNH depends on the concentration of Kupffer cells in the FNH lesion. Unfortunately, other hepatocellular neoplasms, such as a hepatocellular adenoma and hepatocellular carcinoma, may also have Kupffer cells and demonstrate99m Tc sulfur colloid uptake. 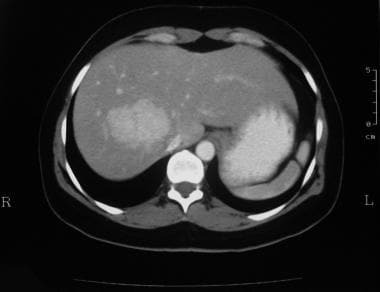 Hepatic adenoma, hemangioma, hepatoblastoma, liver herniation, and hepatocellular carcinoma may be similar in appearance on99m Tc sulfur colloid scans. Angiographic findings demonstrate a discretely marginated mass. When the mass is small, the arteries supplying the mass break up into small branches, which appear to permeate the FNH and form a reticular pattern. These branches are not dilated, but the overall impression is that of increased vascularity. Vascularity may be decreased within the central stellate scar. In the parenchymal phase, a fine, homogeneous granularity is demonstrated; occasionally, a lucent ring is seen around the mass. In large tumors, the dilated main feeding artery perforates the center of the tumor. Peripheral arteries arise from the central artery; these are arranged in a spoke-wheel pattern. Craig JR, Peters RL, Edmondson HA, Omata M. Fibrolamellar carcinoma of the liver: a tumor of adolescents and young adults with distinctive clinico-pathologic features. Cancer. 1980 Jul 15. 46(2):372-9. [Medline]. Wanless IR, Albrecht S, Bilbao J, Frei JV, Heathcote EJ, Roberts EA. Multiple focal nodular hyperplasia of the liver associated with vascular malformations of various organs and neoplasia of the brain: a new syndrome. Mod Pathol. 1989 Sep. 2(5):456-62. [Medline]. McInnes MD, Hibbert RM, Inácio JR, Schieda N. Focal Nodular Hyperplasia and Hepatocellular Adenoma: Accuracy of Gadoxetic Acid-enhanced MR Imaging-A Systematic Review. Radiology. 2015 Nov. 277 (2):413-23. [Medline]. Roux M, Pigneur F, Calderaro J, Baranes L, Chiaradia M, Tselikas L, et al. Differentiation of focal nodular hyperplasia from hepatocellular adenoma: Role of the quantitative analysis of gadobenate dimeglumine-enhanced hepatobiliary phase MRI. J Magn Reson Imaging. 2015 Nov. 42 (5):1249-58. [Medline]. Bhoil A, Gayana S, Sood A, Bhattacharya A, Mittal BR. Hybrid single photon emission computed tomography/computed tomography sulphur colloid scintigraphy in focal nodular hyperplasia. World J Nucl Med. 2013 Sep. 12 (3):124-5. [Medline]. Roche V, Pigneur F, Tselikas L, Roux M, Baranes L, Djabbari M, et al. Differentiation of focal nodular hyperplasia from hepatocellular adenomas with low-mechanical-index contrast-enhanced sonography (CEUS): effect of size on diagnostic confidence. Eur Radiol. 2015 Jan. 25 (1):186-95. [Medline]. Bertin C, Egels S, Wagner M, Huynh-Charlier I, Vilgrain V, Lucidarme O. Contrast-enhanced ultrasound of focal nodular hyperplasia: a matter of size. Eur Radiol. 2014 Oct. 24 (10):2561-71. [Medline]. An HS, Park HS, Kim YJ, Jung SI, Jeon HJ. Focal nodular hyperplasia: characterisation at gadoxetic acid-enhanced MRI and diffusion-weighted MRI. Br J Radiol. 2013 Aug. 86 (1028):20130299. [Medline]. Piscaglia F, Venturi A, Mancini M, Giangregorio F, Vidili G, Magnolfi F, et al. Diagnostic features of real-time contrast-enhanced ultrasound in focal nodular hyperplasia of the liver. Ultraschall Med. 2010 Jun. 31 (3):276-82. [Medline]. Knowles DM 2nd, Casarella WJ, Johnson PM, Wolff M. The clinical, radiologic, and pathologic characterization of benign hepatic neoplasms. Alleged association with oral contraceptives. Medicine (Baltimore). 1978 May. 57(3):223-37. [Medline]. Carlson SK, Johnson CD, Bender CE, Welch TJ. CT of focal nodular hyperplasia of the liver. AJR Am J Roentgenol. 2000 Mar. 174(3):705-12. [Medline]. Kubaska S, Sahani DV, Saini S, et al. Dual contrast enhanced magnetic resonance imaging of the liver with superparamagnetic iron oxide followed by gadolinium for lesion detection and characterization. Clin Radiol. 2001 May. 56(5):410-5. [Medline]. Uggowitzer MM, Kugler C, Mischinger HJ, et al. 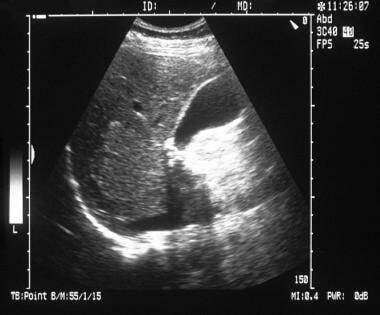 Echo-enhanced Doppler sonography of focal nodular hyperplasia of the liver. J Ultrasound Med. 1999 Jul. 18(7):445-51; quiz 453-4. [Medline]. Lee IJ, Jeong SH, Choi JW, Park HS, Lee KH, Kim H. Radiological findings in a case of multiple focal nodular hyperplasia associated with portal vein atresia and portopulmonary hypertension. Korean J Radiol. 2008 Aug. 9(4):386-9. [Medline]. Nguyen BN, Fléjou JF, Terris B, Belghiti J, Degott C. Focal nodular hyperplasia of the liver: a comprehensive pathologic study of 305 lesions and recognition of new histologic forms. Am J Surg Pathol. 1999 Dec. 23(12):1441-54. [Medline]. Paradis V, Benzekri A, Dargère D, Bièche I, Laurendeau I, Vilgrain V. Telangiectatic focal nodular hyperplasia: a variant of hepatocellular adenoma. Gastroenterology. 2004 May. 126(5):1323-9. [Medline]. Dähnert W. Disorders of liver, biliary tract and spleen. Radiology Review Manual. 6th Edition. Philadelphia, Pa: Wolters Kluwer Health; 2006. 714-715. Semelka RC, Martin DR, Balci C, Lance T. Focal liver lesions: comparison of dual-phase CT and multisequence multiplanar MR imaging including dynamic gadolinium enhancement. J Magn Reson Imaging. 2001 Mar. 13(3):397-401. [Medline]. Sudour H, Mainard L, Baumann C, Clement L, Salmon A, Bordigoni P. Focal nodular hyperplasia of the liver following hematopoietic SCT. Bone Marrow Transplant. 2008 Sep 22. [Medline]. Attal P, Vilgrain V, Brancatelli G, Paradis V, Terris B, Belghiti J. Telangiectatic focal nodular hyperplasia: US, CT, and MR imaging findings with histopathologic correlation in 13 cases. Radiology. 2003 Aug. 228(2):465-72. [Medline]. Shen YH, Fan J, Wu ZQ, Ma ZC, Zhou XD, Zhou J. Focal nodular hyperplasia of the liver in 86 patients. Hepatobiliary Pancreat Dis Int. 2007 Feb. 6(1):52-7. [Medline]. Vilgrain V, Flejou JF, Arrive L, et al. Focal nodular hyperplasia of the liver: MR imaging and pathologic correlation in 37 patients. Radiology. 1992 Sep. 184(3):699-703. [Medline]. Tello R, Fenlon HM, Gagliano T, et al. Prediction rule for characterization of hepatic lesions revealed on MR imaging: estimation of malignancy. AJR Am J Roentgenol. 2001 Apr. 176(4):879-84. [Medline]. Hong HS, Kim HS, Kim MJ, De Becker J, Mitchell DG, Kanematsu M. Single breath-hold multiarterial dynamic MRI of the liver at 3T using a 3D fat-suppressed keyhole technique. J Magn Reson Imaging. 2008 Aug. 28(2):396-402. [Medline]. Zech CJ, Grazioli L, Breuer J, Reiser MF, Schoenberg SO. Diagnostic performance and description of morphological features of focal nodular hyperplasia in Gd-EOB-DTPA-enhanced liver magnetic resonance imaging: results of a multicenter trial. Invest Radiol. 2008 Jul. 43(7):504-11. [Medline]. Venkatesh SK, Yin M, Glockner JF, Takahashi N, Araoz PA, Talwalkar JA, et al. MR elastography of liver tumors: preliminary results. AJR Am J Roentgenol. 2008 Jun. 190(6):1534-40. [Medline]. Purysko AS, Remer EM, Coppa CP, Obuchowski NA, Schneider E, Veniero JC. Characteristics and distinguishing features of hepatocellular adenoma and focal nodular hyperplasia on gadoxetate disodium-enhanced MRI. AJR Am J Roentgenol. 2012 Jan. 198(1):115-23. [Medline]. Portilha MA, Pedro MT, Ruivo C, Semedo LC, Marques C, Alves FC. [Gd-EOB-DTPA-enhanced magnetic resonance imaging: differentiation between focal nodular hyperplasia and hepatocellular adenoma]. Acta Med Port. 2011 Dec. 24 Suppl 2:531-8. [Medline]. Marin D, Brancatelli G, Federle MP, Lagalla R, Catalano C, Passariello R, et al. Focal nodular hyperplasia: typical and atypical MRI findings with emphasis on the use of contrast media. Clin Radiol. 2008 May. 63(5):577-85. [Medline]. De Gaetano A, De Franco A, Maresca G, et al. [The integrated diagnosis of hepatic focal nodular hyperplasia: echography, color Doppler, computed tomography and magnetic resonance compared]. Radiol Med (Torino). 1996 Mar. 91(3):258-69. [Medline]. Uggowitzer M, Kugler C, Machan L, et al. Power Doppler imaging and evaluation of the resistive index in focal nodular hyperplasia of the liver. Abdom Imaging. 1997 May-Jun. 22(3):268-73. [Medline]. Ungermann L, Eliáš P, Zižka J, Ryška P, Klzo L. Focal nodular hyperplasia: Spoke-wheel arterial pattern and other signs on dynamic contrast-enhanced ultrasonography. Eur J Radiol. 2007 Mar 10. [Medline].